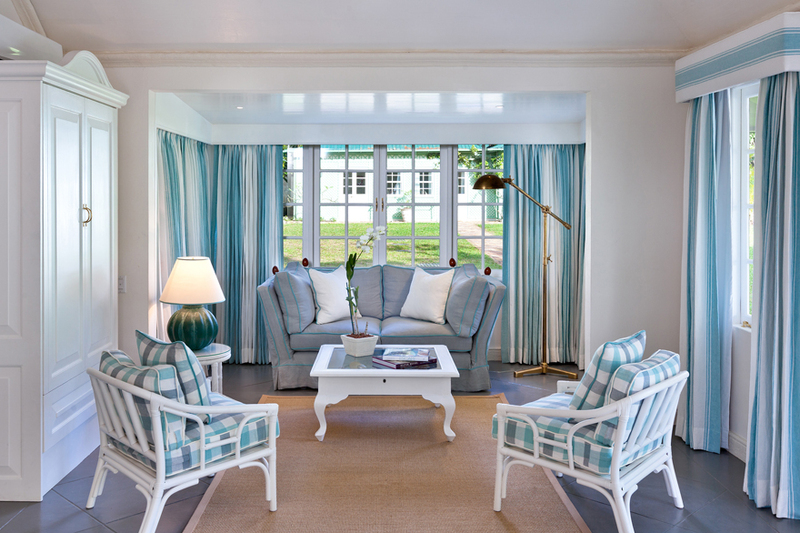 The living room at Crystal Springs has been beautifully appointed with elegant yet comfortable furnishings, notable local artwork and a seaside motif featuring shells, sea fans and coral. The sitting area invites guests to relax and take in the peaceful surroundings, enhanced by the lull of the waves located just steps away. 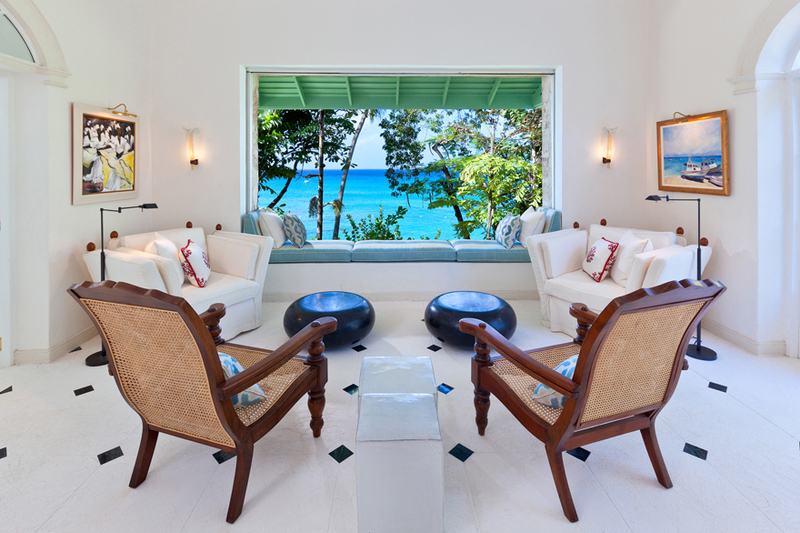 The room features one of Oliver Messel's signature trademarks: a large panoramic window facing the sea. 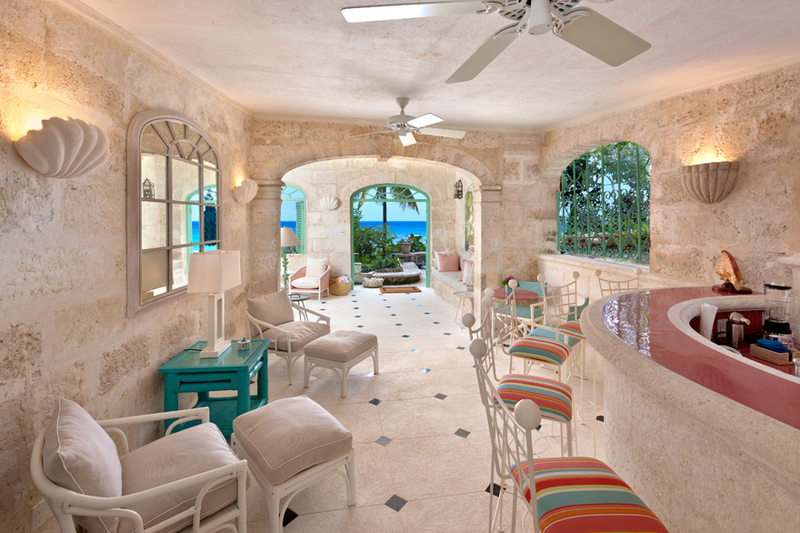 Relax with a cup of coffee, evening cocktail or a book and enjoy the sound of the beautiful Caribbean sea lapping on the beach below. The Annex Patio provides an inviting space to relax on one's own or with an intimate group; adjacent to the Annex Bar area, it is a great spot for early evening cocktails. 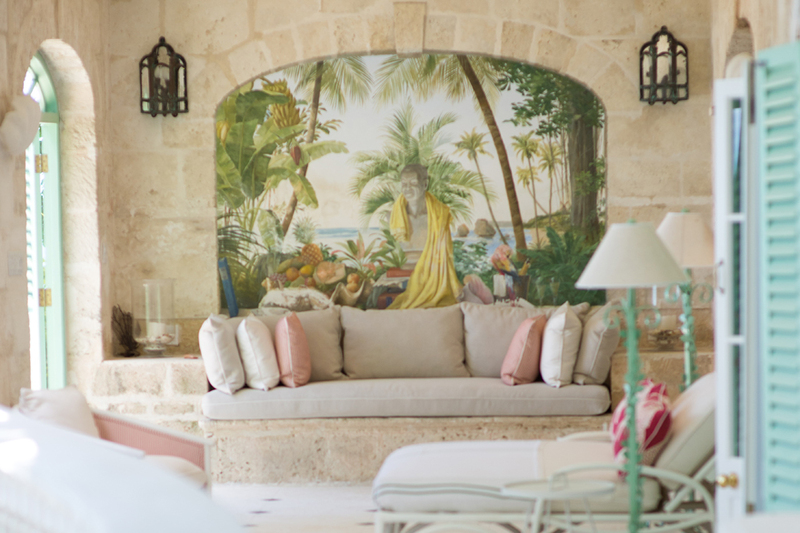 The patio features a unique mural of Oliver Messel himself, surrounded by the Barbadian iconography that inspired his architectural style. The Annex Bar, with views to the sea, is perfect for that afternoon pick-me-up or pre-dinner cocktail. The butlers will be happy to mix a batch of delicious rum punch - ask them for the Crystal Springs’ recipe! The Annex Bar also provides service to the pool area, should cool refreshments or light snacks be desired. This charming coral stone patio runs adjacent to the Caribbean Sea; lined with Adirondack chairs, it's a popular spot to watch the sun set on the horizon with a handcrafted rum punch in hand. It is also a charming spot to enjoy a quiet cup of tea or coffee in the early morning, with the sound of the waves gently lapping the shore. 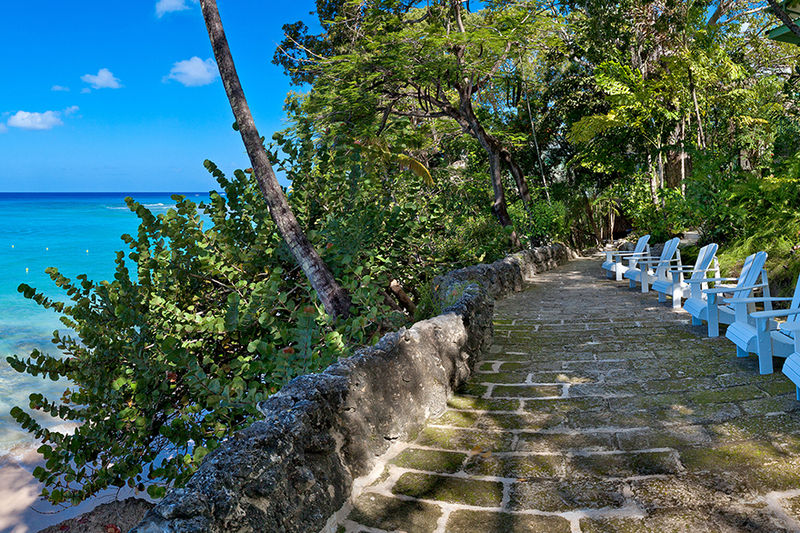 Accessed via a stone stairway from the Gazebo, the patio connects to the southern edge of Cove Beach, where a staircase descends to the white sands below. The Tea House offers private indoor and outdoor seating areas where you can kick up your feet and enjoy some quiet time alone or with a loved one. 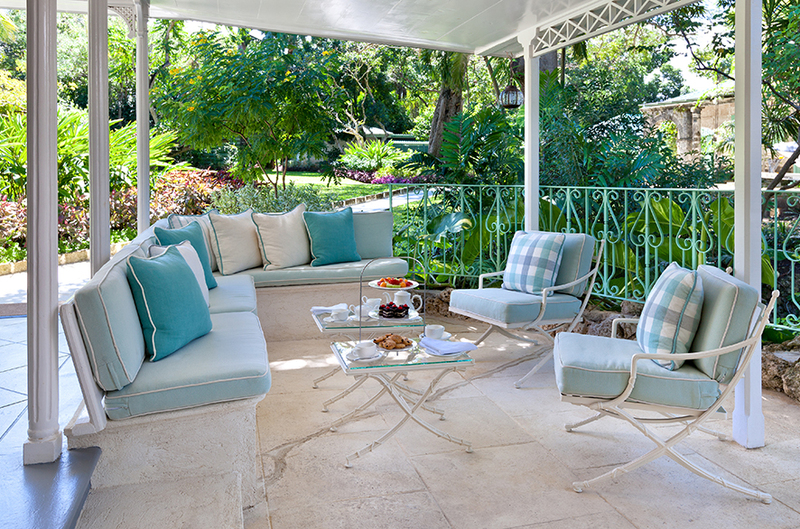 Afternoon tea on the Tea House patio! 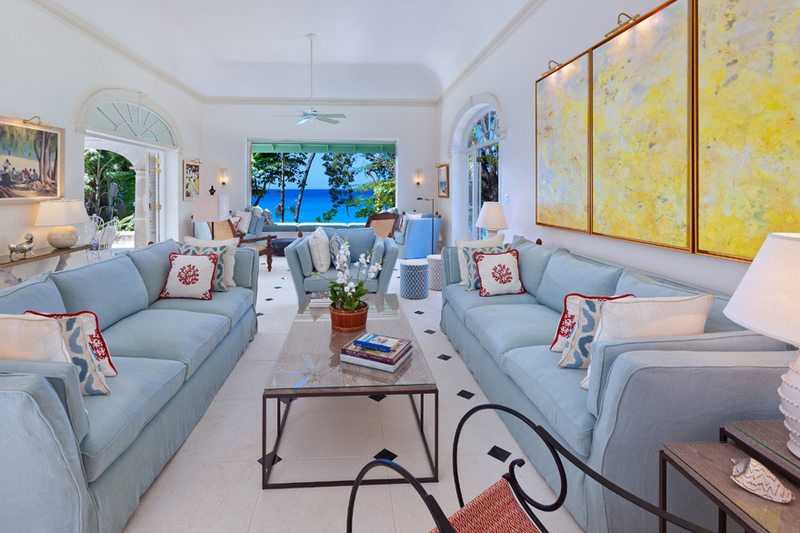 The 12,000 sq ft residence comprises six exquisite buildings connected by coral stone terraces and pathways; each offers delightful space for relaxing and entertaining. With 10 en suite bedrooms, it is the ideal villa for large groups, families and corporate gatherings. There are three al fresco dining areas, as well as an impressive array of onsite activities available, including the Cove Beach, state-of-the-art cinema and Fitness Centre, as well as a private gully. Crystal Springs is a beachfront home. It should be noted that beaches change their shape and size from day to day, week to week and month to month, mainly as a response to seasonal waves, currents and tides. Every effort has been made to depict the beach in front of this property, but temporary changes may occur.